Natural and Man-made Disasters - Welcome to Our Generation USA! Pictured: L-R: A tornado striking ground (Texas, F3 Tornado); a daytime wildfire in California and Lightning striking a tree. Click here for a list natural disasters striking the United States. A natural disaster can cause loss of life or property damage, and typically leaves some economic damage in its wake, the severity of which depends on the affected population's ability to recover and also on the infrastructure available. An adverse event will not rise to the level of a disaster if it occurs in an area without vulnerable population. In a vulnerable area, however, such as Nepal during the 2015 earthquake, an earthquake can have disastrous consequences and leave lasting damage, requiring years to repair. Anthropogenic hazards are those hazards caused directly or indirectly by human action or inaction. They can be contrasted with natural hazards. Anthropogenic hazards may adversely affect humans, other organisms and biomes and eco-systems. The frequency and severity of hazards are key elements in some risk analysis methodologies. ​Hazards may also be described in relation to the impact that they have. Environmental hazards may be very different from human hazards. A hazard only exists if there is a pathway to exposure. As an example the center of the earth consists of molten material at very high temperatures which would be a severe hazard if contact was made with the core. However, there is no feasible way of making contact with the core, therefore the center of the earth currently poses no hazard. Deepwater Horizon was an ultra-deepwater, dynamically positioned, semi-submersible offshore drilling rig owned by Transocean. Built in 2001 in South Korea by Hyundai Heavy Industries, the rig was commissioned by R&B Falcon (a later asset of Transocean), registered in Majuro, and leased to BP from 2001 until September 2013. The explosion and subsequent fire resulted in the sinking of the Deepwater Horizon and the deaths of 11 workers; 17 others were injured. 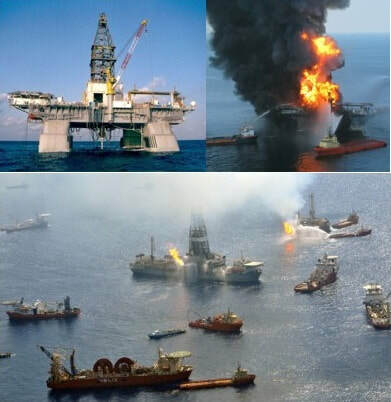 The same blowout that caused the explosion also caused a massive offshore oil spill in the Gulf of Mexico, considered the largest accidental marine oil spill in the world, and the largest environmental disaster in U.S. history. "Deepwater Horizon Joint Investigation Team Report". Bureau of Safety and Environmental Enforcement. 9 September 2011. ​​The Deepwater Horizon oil spill (also referred to as the BP oil spill, the BP oil disaster, the Gulf of Mexico oil spill, and the Macondo blowout) began on April 20, 2010, in the Gulf of Mexico on the BP-operated Macondo Prospect. Killing eleven people, it is considered the largest marine oil spill in the history of the petroleum industry and estimated to be 8% to 31% larger in volume than the previous largest, the Ixtoc I oil spill. The US Government estimated the total discharge at 4.9 million barrels (210 million US gal; 780,000 m3). After several failed efforts to contain the flow, the well was declared sealed on September 19, 2010. Reports in early 2012 indicated that the well site was still leaking. A massive response ensued to protect beaches, wetlands and estuaries from the spreading oil utilizing skimmer ships, floating booms, controlled burns and 1.84 million US gallons (7,000 m3) of oil dispersant. Due to the months-long spill, along with adverse effects from the response and cleanup activities, extensive damage to marine and wildlife habitats and fishing and tourism industries was reported. In Louisiana, 4,900,000 pounds (2,200 t) of oily material was removed from the beaches in 2013, over double the amount collected in 2012. Oil cleanup crews worked four days a week on 55 miles (89 km) of Louisiana shoreline throughout 2013. Oil continued to be found as far from the Macondo site as the waters off the Florida Panhandle and Tampa Bay, where scientists said the oil and dispersant mixture is embedded in the sand. 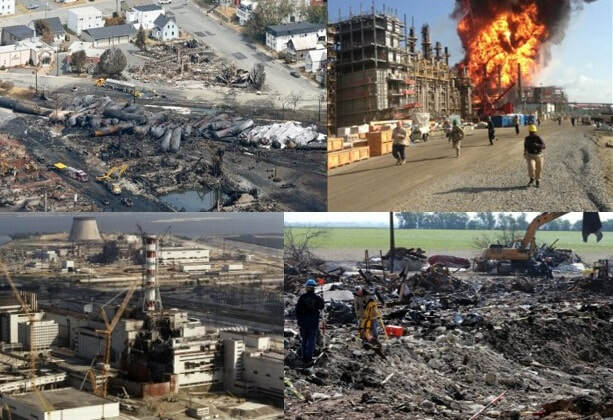 Numerous investigations explored the causes of the explosion and record-setting spill. The U.S. government September 2011 report pointed to defective cement on the well, faulting mostly BP, but also rig operator Transocean and contractor Halliburton. Earlier in 2011, a White House commission likewise blamed BP and its partners for a series of cost-cutting decisions and an inadequate safety system, but also concluded that the spill resulted from "systemic" root causes and "absent significant reform in both industry practices and government policies, might well recur". BP also agreed to four years of government monitoring of its safety practices and ethics, and the Environmental Protection Agency announced that BP would be temporarily banned from new contracts with the US government. BP and the Department of Justice agreed to a record-setting $4.525 billion in fines and other payments. As of February 2013, criminal and civil settlements and payments to a trust fund had cost the company $42.2 billion. Erik Stokstad (8 February 2013). "BP Research Dollars Yield Signs of Cautious Hope". Sciencemag.org. Retrieved 25 February 2013. Canada – Deadly train derailment: At least 38 people were killed and 37 are still missing in the small town of Lac Megantic, Quebec, where a runaway train exploded in the downtown district on Saturday, July 6, 2013. Police suspect that some of the victims were vaporized in the explosion. Louisiana chemical plant explosion: A June 13 explosion at a chemical plant in Louisiana killed one person and forced authorities to ask people as far as 2 miles away to stay inside to avoid exposure to potentially deadly fumes. At least 75 people were injured in the blast. West, Texas fertilizer plant explosion: a massive explosion at a fertilizer plant in West, Texas killed 35 people, including 10 first responders to the fire that precipitated the explosion. Soviet Union – Chernobyl: The initial death toll was 32, from the 1986 explosion in the core of a nuclear reactor at Chernobyl in Ukraine, then part of the Soviet Union. But the International Atomic Energy Agency estimates the total number of deaths from contamination will reach about 4,000. The disaster sent a cloud of radioactive fallout over hundreds of thousands of square miles of Russia, Belarus and Ukraine. The radioactive effects of the explosion were about 400 times more potent than the bomb dropped on Hiroshima during World War II. Other disasters can also be considered industrial disasters, if their causes are rooted in the products or processes of industry. For example, the Great Chicago Fire of 1871 was made more severe due to the heavy concentration of lumber industry facilities, wood houses, and fuel and other chemicals in a small area. The Convention on the Transboundary Effects of Industrial Accidents is designed to protect people and the environment from industrial accidents. The Convention aims to prevent accidents from occurring, to reduce their frequency and severity, and to mitigate their effects. The Convention addresses primarily industrial accidents in one country that affect the population and the environment of another country. YouTube Video: What is a Tropical Cyclone? Pictured below: Hurricane Isabel (2003) as seen from orbit during Expedition 7 of the International Space Station. The eye, eyewall, and surrounding rainbands, characteristics of tropical cyclones in the narrow sense, are clearly visible in this view from space. "Tropical" refers to the geographical origin of these systems, which form almost exclusively over tropical seas. "Cyclone" refers to their winds moving in a circle, whirling round their central clear eye, with their winds blowing counterclockwise in the Northern Hemisphere and clockwise in the Southern Hemisphere. The opposite direction of circulation is due to the Coriolis effect. Tropical cyclones typically form over large bodies of relatively warm water. They derive their energy through the evaporation of water from the ocean surface, which ultimately recondenses into clouds and rain when moist air rises and cools to saturation. This energy source differs from that of mid-latitude cyclonic storms, such as nor'easters and European windstorms, which are fueled primarily by horizontal temperature contrasts. Tropical cyclones are typically between 100 and 2,000 km (62 and 1,243 mi) in diameter. The strong rotating winds of a tropical cyclone are a result of the conservation of angular momentum imparted by the Earth's rotation as air flows inwards toward the axis of rotation. As a result, they rarely form within 5° of the equator. Tropical cyclones are almost unknown in the South Atlantic due to a consistently strong wind shear and a weak Intertropical Convergence Zone. Coastal regions are particularly vulnerable to the impact of a tropical cyclone, compared to inland regions. The primary energy source for these storms is warm ocean waters, therefore these forms are typically strongest when over or near water, and weaken quite rapidly over land. Coastal damage may be caused by strong winds and rain, high waves (due to winds), storm surges (due to wind and severe pressure changes), and the potential of spawning tornadoes. Tropical cyclones also draw in air from a large area—which can be a vast area for the most severe cyclones—and concentrate the precipitation of the water content in that air (made up from atmospheric moisture and moisture evaporated from water) into a much smaller area. TOP: A beastly tornado drills across the landscape near Dodge City, KS on May 24, 2016. Image credit: Ian Livingston. The windstorm is often referred to as a twister, whirlwind or cyclone, although the word cyclone is used in meteorology to name a weather system with a low-pressure area in the center around which winds blow counterclockwise in the Northern Hemisphere and clockwise in the Southern. Tornadoes come in many shapes and sizes, and they are often visible in the form of a condensation funnel originating from the base of a cumulonimbus cloud, with a cloud of rotating debris and dust beneath it. Most tornadoes have wind speeds less than 110 miles per hour (180 km/h), are about 250 feet (80 m) across, and travel a few miles (several kilometers) before dissipating. The most extreme tornadoes can attain wind speeds of more than 300 miles per hour (480 km/h), are more than two miles (3 km) in diameter, and stay on the ground for dozens of miles (more than 100 km). Various types of tornadoes include the multiple vortex tornado, landspout and waterspout. Waterspouts are characterized by a spiraling funnel-shaped wind current, connecting to a large cumulus or cumulonimbus cloud. They are generally classified as non-supercellular tornadoes that develop over bodies of water, but there is disagreement over whether to classify them as true tornadoes. These spiraling columns of air frequently develop in tropical areas close to the equator, and are less common at high latitudes. Other tornado-like phenomena that exist in nature include the gustnado, dust devil, fire whirls, and steam devil. Tornadoes occur in North America, particularly in the area of the United States known as tornado alley (see below), as well as in northern and east-central South America, Southern Africa, northwestern and southeast Europe, western and southeastern Australia, and New Zealand. Tornadoes can be detected before or as they occur through the use of Pulse-Doppler radar by recognizing patterns in velocity and reflectivity data, such as hook echoes or debris balls, as well as through the efforts of storm spotters. There are several scales for rating the strength of tornadoes. The Fujita scale rates tornadoes by damage caused and has been replaced in some countries by the updated Enhanced Fujita Scale. An F0 or EF0 tornado, the weakest category, damages trees, but not substantial structures. 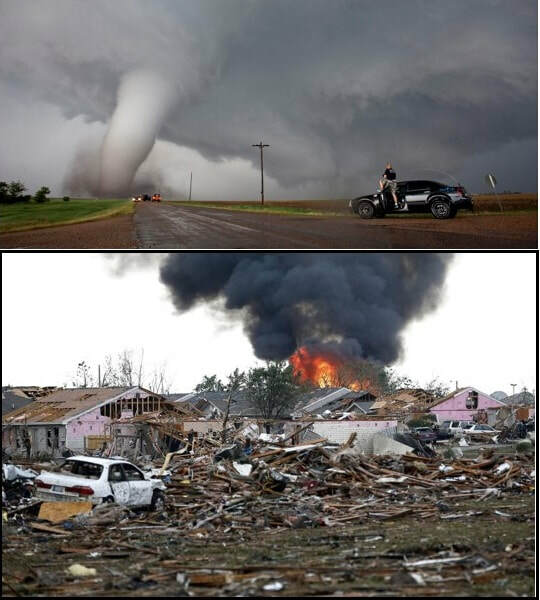 An F5 or EF5 tornado, the strongest category, rips buildings off their foundations and can destroy large skyscrapers. The similar TORRO scale ranges from a T0 for extremely weak tornadoes to T11 for the most powerful known tornadoes. ​Doppler radar data, photogrammetry, and ground swirl patterns (trochoidal marks) may also be analyzed to determine intensity and assign a rating. Tornado Alley is a colloquial term for the area of the United States (or by some definitions extending into Canada) where tornadoes are most frequent. Tornado Alley is largely a media-driven term although tornado climatologists distinguish peaks in activity in certain areas and storm chasers have long recognized the Great Plains tornado belt. Although the official boundaries of Tornado Alley are not clearly defined, its core extends from northern Texas, Oklahoma, Kansas, into Nebraska. Some research suggests that tornadoes are becoming more frequent in the northern parts of Tornado Alley where it reaches the Canadian prairies. or c) the aircraft goes missing or becomes completely inaccessible. Annex 13 defines an incident as an occurrence, other than an accident, associated with the operation of an aircraft that affects or could affect the safety of operation. ​The first fatal aviation accident was the crash of a Rozière balloon near Wimereux, France, on June 15, 1785, killing the balloon's inventor, Jean-François Pilâtre de Rozier, and the other occupant, Pierre Romain. The first involving a powered aircraft was the crash of a Wright Model A aircraft at Fort Myer, Virginia, in the United States on September 17, 1908, injuring its co-inventor and pilot, Orville Wright, and killing the passenger, Signal Corps Lieutenant Thomas Selfridge. ​A mining accident is an accident that occurs during the process of mining minerals. Coal mining is considered much more hazardous than hard rock mining due to flat-lying rock strata, generally incompetent rock, the presence of methane gas, and coal dust. Most of the deaths these days occur in developing countries, and rural parts of developed countries. 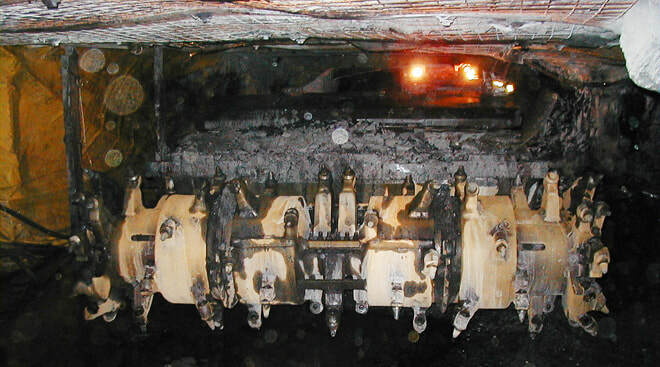 Mining accidents can have a variety of causes, including leaks of poisonous gases such as hydrogen sulfide or explosive natural gases, especially firedamp or methane, dust explosions, collapsing of mine stopes, mining-induced seismicity, flooding, or general mechanical errors from improperly used or malfunctioning mining equipment (such as safety lamps or electrical equipment). Use of improper explosives underground can also cause methane and coal dust explosions. 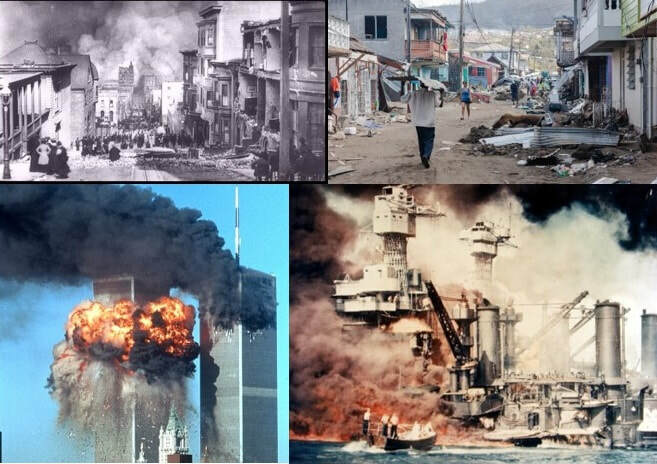 This list of United States disasters by death toll is a list of notable disasters which occurred either in the United States, at diplomatic missions of the United States, or incidents outside of the United States in which a number of U.S. citizens were killed. It does not include death tolls from the American Civil War. Due to inflation, the monetary damage estimates are not comparable. Unless otherwise noted, the year given is the year in which the currency's valuation was calculated. This list is not comprehensive in general and epidemics are not included.